Approximately 1 lb of CO2 is avoided per every 30 standard masonry blocks made by Shaw Brick with the CarbonCure Technology. 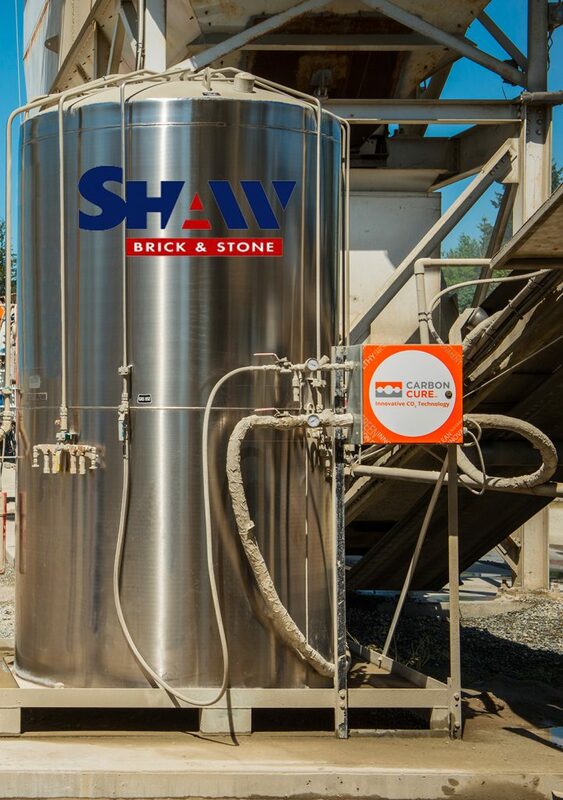 Shaw Brick is proud to partner with award-winning CarbonCure Technologies to bring blocks made with recycled CO2 to our community from our Dartmouth plant. CarbonCure introduces recycled carbon dioxide (CO2) into the concrete mix in order to reduce the concrete products' carbon footprint. Once introduced to the fresh concrete mix, the CO2 chemically converts to a mineral and becomes permanently embedded in the concrete masonry product. Since the CO2 has been converted to a mineral, it will never re-escape into the atmosphere, because the CO2 no longer exists! Approximately 1 lb of CO2 is permanently captured for every 30 standard masonry blocks made with the CarbonCure Technology. The CarbonCure Technology has no impact on the hardened properties of the concrete masonry units, including durability, colour, texture, size, weight, and fire-rating. Every concrete masonry product manufactured by Shaw Brick in Dartmouth is automatically made with recycled CO2. It's our commitment to sustainability!